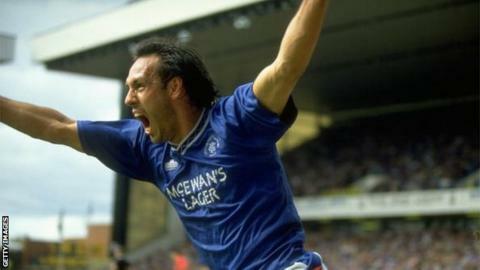 When Rangers and Aberdeen met at Ibrox 25 years ago, they were only separated by the narrowest of margins. They converged for a title-deciding match, and the outcome left one club on course for a historic achievement and the other only with regrets. The occasion, and the raucous intensity of the crowd, was a test of the players' characters. Meekness would have undermined either side's challenge for the title, but the encounter was finely-balanced before it began. Rangers had the advantage of being at home, with the backing of the vast majority of fans inside Ibrox. Yet Aberdeen were the form team, arriving in Glasgow on the back of a run that saw them recover from being seven points behind with 10 games to go. On the day of the decider, they were top of the league courtesy of having scored two more goals than Rangers. That was all that was between the teams, because they were level on points and on goal difference. "We were in really good form and it was all looking good going into the game at Ibrox. We were pretty confident," says Brian Irvine, who was a key pillar of the Aberdeen defence in that campaign, but was injured for the decider and had to watch from the bench. "It was very tense and nervous the night before the game. But in Alex McLeish, Stewart McKimmie and Theo Snelders, we had excellent players, and Hans Gilhaus was also a real top-class player. Peter van de Ven, Brian Grant, Bobby Connor, were all great midfield players." Rangers, too, were burdened by their own difficulties. Key players were injured and suspended, while others who made the squad were barely in any condition to play. John Brown took an injection in his Achilles tendon before kick-off, but was still told that it was inevitable the tendon would snap during the game. Ally McCoist and Ian Durrant were on the bench, despite neither being fully fit, and both had to come on to play for significant periods. The manager Walter Smith, too, was working in new circumstances. He had been assistant to Graeme Souness for five years, but the latter's abrupt departure for Liverpool the month before left Smith in charge at a pivotal moment. The Aberdeen game was only his fourth as manager, and the previous week a defeat by Motherwell had handed Alex Smith's side a slight initiative. At Ibrox, a draw would have been enough for the visitors to triumph. "I was captain that day, because Richard Gough had been ill for a few weeks in hospital," recalls Nigel Spackman, the former Rangers midfielder. "I can always remember Walter calling me in - and it was his first title as well - that with all these injuries he was struggling to put a team out and we had to beat Aberdeen." Critical events were scattered through the game. Mark Hateley's unforgiving leap into the air to win a high ball from Michael Watt, Aberdeen's young goalkeeper, set the tone for the occasion. It also left Watt crumpled on the ground. Aberdeen might have taken the initiative, but Gilhaus headed over and Van de Ven shot straight at Chris Woods when clean through. Rangers needed to overcome further setbacks, with the left-back Tom Cowan breaking his leg - although he played on for 10 minutes before realising and being replaced by Durrant. The decisive moments came either side of half-time. Hateley delivered them both, winning a towering header from Mark Walters' cross to bullet the ball past Watt, then after the interval converting from close range after Watt spilled a Maurice Johnston cross. "We always felt we were going to win that day," Spackman says. "After John Brown [injured his Achilles], I ended up playing centre-half, Terry Hurlock ended up playing left-back. It was just one of those amazing games. "You can still remember the day because the atmosphere was so good. I see Big Eck [Alex McLeish] sometimes doing my TV work and I always remind him of big Mark knocking him out the way for that header. Great memories. "That was [a pivotal moment in the nine-in-a-row run]. It never got that close again, having to win on the last day of the season. From that point on, Walter was in charge and things got better and better." When Smith ended his second spell as Rangers manager five years ago and reflected on his career, he described the win over Aberdeen in 1991 as the greatest of his time in charge at Ibrox. His team went on to achieve nine successive titles and match Celtic's record, but Aberdeen fell into a slump. The previous season, Alex Smith's side had won the Scottish League Cup and Scottish Cup, but following the Ibrox loss the club struggled to repeat their title challenge, slumping to sixth. "It was pretty agonising to watch [the defeat at Ibrox]," says Irvine. "Rangers got off to a good start. We had chances as well, and if we'd got a goal early, it would have been a whole different game. "We were just so close. When Rangers got their goal, it gave them confidence and it just drifted away from us."